Studying Macroeconomics to Understand Issue This class is Principles of Macroeconomics. Instruction: One 3 page paper should be double-spaced and should describe how studying macroeconomics has helped you understand an issue that will be helpful to you in your life or will help you understand a major current national issue. Please Include reference page and in-text citation – APA format. 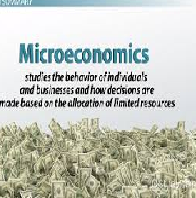 Macroeconomics is a branch of the economics that studies how the aggregate economy behaves.